japanese practice koh kitayama + architecture WORKSHOP has shared with us images of ‘dada house’, a two-storey residence and gallery in tokyo, japan. conceived for a client who is a researcher in the topic of public art, the design explores the dichotomy of a space that is closely related to the site and one that is calm and closed-off from the street. 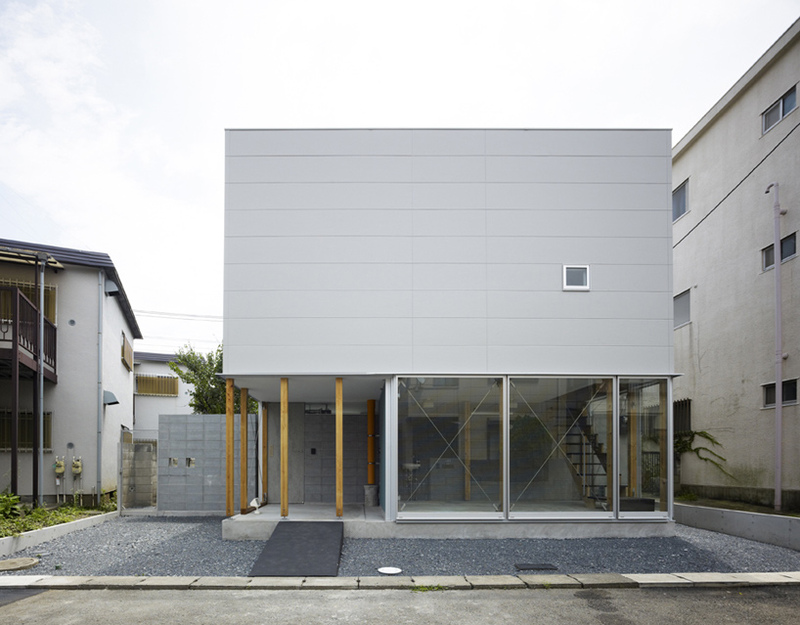 a simple box-like volume, the simple and unassuming exterior is a composition of solid and transparent surfaces. the ground floor facing the street exhibits floor-to-ceiling glass which loosely encases an exhibition gallery by the entrance. punctuated by a series of contrasting wooden pillars, the freestanding residence is read to be supported on a system of piloti. the top-heavy design is visually balanced out by the glazed base in both materiality and sense of openness with the site. bisected by a concrete-block wall, the ground floor defines a clear separation in layout and privacy between the gallery and the dwelling. to the back of the house is an open space which surrounds itself within an outdoor garden. the transparent language of the street facade is continued with different atmospheric results. in contrast, the upper level is approached as a quiet library devoid of windows or apertures. the storey revolves around a small central courtyard that widens at an angle towards the ceiling. the funnel-like void space acts as a lightwell, softly illuminating the space with indirect natural daylight. hmmm…just look at this project in iran and specially the central water drain. It\’s be nice to see furniture in some of these \”wonderful\” buildings – human inhabitation after all.